The cutting away of forbidden fat and veins from kasher meat. The Mosaic law emphatically forbids the eating of the fat and blood of cattle or poultry, the fat and blood of peace-offerings being appropriated as sacrifices to God. The prohibition is "a perpetual statute" in all generations everywhere (Lev. iii. 17, vii. 25-27). What constitutes "ḥeleb"(="forbidden fat") is deduced from the description of the ḥeleb appropriated for sacrifice, namely, the "fat that covereth the inwards" (intestines) and "the fat on the kidneys by the flanks and the caul [lobe] above the liver" (ib. iii. 3, 4). 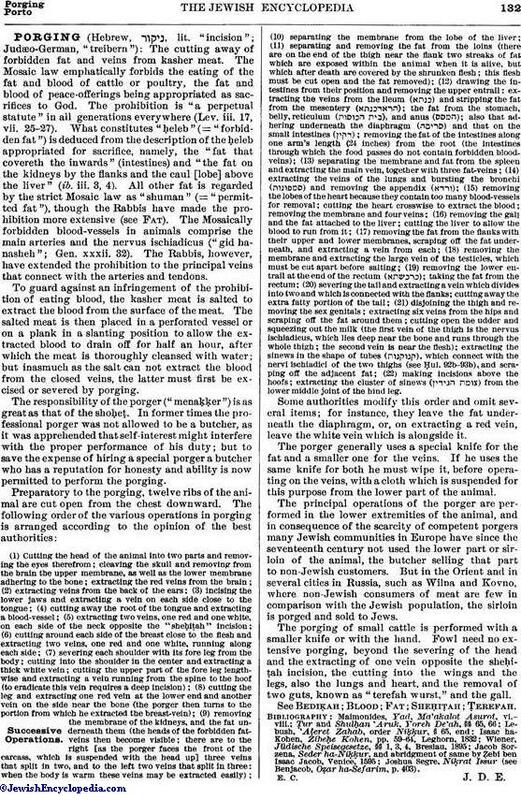 All other fat is regarded by the strict Mosaic law as "shuman" (="permitted fat"), though the Rabbis have made the prohibition more extensive (see Fat). The Mosaically forbidden blood-vessels in animals comprise the main arteries and the nervus ischiadicus ("gid hanasheh"; Gen. xxxii. 32). The Rabbis, however, have extended the prohibition to the principal veins that connect with the arteries and tendons. To guard against an infringement of the prohibition of eating blood, the kasher meat is salted to extract the blood from the surface of the meat. The salted meat is then placed in a perforated vessel or on a plank in a slanting position to allow the extracted blood to drain off for half an hour, after which the meat is thoroughly cleansed with water; but inasmuch as the salt can not extract the blood from the closed veins, the latter must first be excised or severed by porging. The responsibility of the porger ("menaḳḳer") is as great as that of the shoḥeṭ. In former times the professional porger was not allowed to be a butcher, as it was apprehended that self-interest might interfere with the proper performance of his duty; but to save the expense of hiring a special porger a butcher who has a reputation for honesty and ability is now permitted to perform the porging. (22) making incisions above the hoofs; extracting the cluster of sinews ( ) from the lower middle joint of the hind leg. Some authorities modify this order and omit several items; for instance, they leave the fat underneath the diaphragm, or, on extracting a red vein, leave the white vein which is alongside it. The porger generally uses a special knife for the fat and a smaller one for the veins. If he uses the same knife for both he must wipe it, before operating on the veins, with a cloth which is suspended for this purpose from the lower part of the animal. The principal operations of the porger are performed in the lower extremities of the animal, and in consequence of the scarcity of competent porgers many Jewish communities in Europe have since the seventeenth century not used the lower part or sirloin of the animal, the butcher selling that part to non-Jewish customers. But in the Orient and in several cities in Russia, such as Wilna and Kovno, where non-Jewish consumers of meat are few in comparison with the Jewish population, the sirloin is porged and sold to Jews. The porging of small cattle is performed with a smaller knife or with the hand. Fowl need no extensive porging, beyond the severing of the head and the extracting of one vein opposite the sheḥiṭah incision, the cutting into the wings and the legs, also the lungs and heart, and the removal of two guts, known as "terefah wurst." and the gall. See Bediḳah; Blood; Fat; Sheḥiṭah; Ṭerefah. Joshua Segre, Niḳrat Issur (see Benjacob, Oẓar ha-Sefarim, p. 403). E. C. J. D. E.